Wearing: St-Agni linen dress (similar here), By Charlotte necklace. While we were in Byron Bay we were lucky enough to stay at our new favourite accommodation, The Bower. It boasts several impeccably curated dwellings on the property but their most intimate space blew us away. “The Barn” is literally a converted barn, with wooden beamed heigh ceilings and quaint cottage windows. It is tucked away from the hustle and bustle of Byron Bay’s main town just minutes away, nestled under the trees that you can watch sway from the bathrooms glass ceiling. The perfect getaway spot for a couple, maybe with a tiny human too. Ru and I had spent the afternoon splashing around in the tub when the sky suddenly opened up, and we got to bathe beneath a thunderstorm in awe. There is no better way to spend a day on holiday. The VictorianÂ slopes will be championing its ownÂ bonafide luxuryÂ accommodation this year with Astra Lodge taking outÂ Australiaâ€™s Best Boutique Ski Lodge 2016 at the World Ski Awards in KitzbÃ¼hel,Â Austria. The award was presented to the family-owned hotelÂ for its newly renovated ski-in ski-out lodge which showcases exceptional featuresÂ such as panoramic mountain views, a heated magnesium mineral pool and fine Italian dining restaurant all under the one roof. The post Step Inside Australia’s Most Luxurious Ski Lodge appeared first on D'Marge. If adults had a Disneyland, this couldÂ be it. Australia’s Hunter Valley is a premier playground for gourmands and sensualists. The region is naturally beautiful, nestled in the foothills of the Brokenback Range and lapped by cooling breezes from the coast. It’s also a pivotal player in the history of Australian winemaking, often hailed as the birthplace of the entire industry. 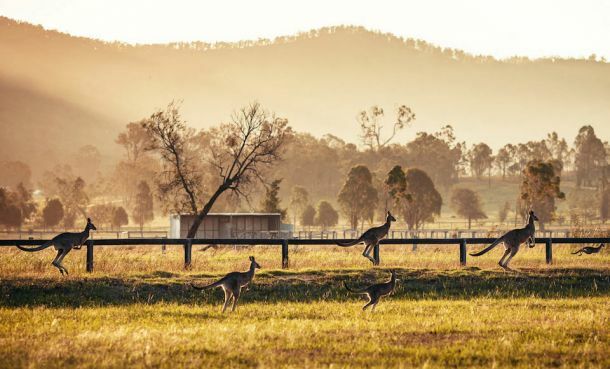 The post Escape City Stress With Our Guide To Hunter Valley Wine Tours appeared first on D'Marge. Wearing: Auguste The Label worn throughout. 1/ Muse Maxi Dress in Khaki Magnolia. 2/ Boheme’s Baby Maxi Dress in Black Gingam. 3/ The Muse Maxi Dress in Autumn Bloom. 4/ 70’s Angel Shirt. 5/ Boheme Goddess Maxi Dress in Texan Bloom Midnight. I’ve just spent a week exploring and shooting in Byron Bay with one of my favourite local labels Auguste The Label. Auguste’s pieces invoke so much of the effortless, carefree and considerate lifestyle that the labels hometown of Byron Bay is known for. Although it is technically winter here in the Southern Hemisphere, the sun and moon were both full and kept us company while standing under waterfalls, climbing trees, finding our favourite spots in town and chasing the sunset through the rolling hills. I have felt eerily connected to Byron Bay each time I have visited, and would love nothing more than a quiet cottage in the Hinterland one day. Thank you Auguste for making so many beautifully magic pieces to feel at home here in. See more of my Auguste Edit on their site here.